Being married in the outdoors is usually something you see in the movies with the beautiful Bride floating through a magical garden surrounded by flowers and bows and big draped columns with the handsome Groom standing at the end of the aisle with his dazzling smile on show. Now whilst this does sound like a fantasy, it is possible to achieve this for yourself whether you plan to get married outside or just hold your wedding reception outdoors! Holding your wedding outside in the fresh air will certainly ensure that you and your guests will be surrounded by plenty of natural beauty and a garden is not the only place where you can get married. At the bottom of a mountain. On a boat or barge. On a country estate or at a country club. Your local or favourite Park. Firstly you need to keep an open mind and remember that you can only do your best to organise the day and then go with the flow. If you can, pick a location that is special to you both. It could be where you first met or where you went on your first date or even where your proposal took place. 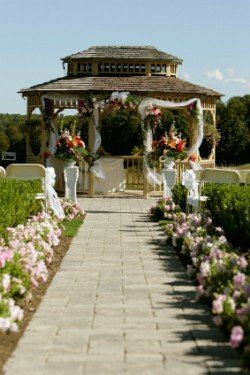 You may however need to consider the season you are marrying in when thinking of ideas for your wedding location. The last thing any guest wants is to be toasting your good health in your back garden in the middle of winter surrounded by snow. Decide whether you want to stick with a formal traditional wedding or whether you fancy something a little bit different, just like your location. You could go for a sit down meal if you prefer or you could even have a barbeque. Can you afford a wedding planner? If not, why not nominate a good friend to take over the duties of a wedding planner on the day, this will definitely take off some of the stress from your shoulders and will allow you to enjoy your day. As with any wedding, it is always useful to shop around and look for the best deals available. It is romantic and relaxing. It is something fun and original. This type of venue could work out cheaper. You may have more options available about how you want your decorations and your layout to be. Your wedding photographs could potentially be stunning. People may be tempted to decline your invitation due to the reception being outdoors, particularly those guests who suffer with allergies or hay fever. You cannot predict what the weather will be like on any given day. Your budget might be extended if you make arrangements for a back up plan.